The Portage, Base and Whitewood Owners Assocation represents its membership in one united voice. There are over 1,000 waterfront properties in the PBWOA membership area. The more waterfront owners who become members of the PBWOA, the greater will be our influence when requesting support from our four townships, two counties or the State of Michigan. There is STRENGTH IN NUMBERS. The PBWOA was founded in 1940. Since then it has helped to determine desirable lake levels, launch the Portage Dam and initiate river dredging to relieve monumental flooding situations that occurred. We also helped promote and establish the Portage/Base Sewer system to bring our lake community into the 21st century, and to create a Marine Patrol with Washtenaw County to provide safer waterways. These accomplishments have served to protect and enhance the property values of all waterfront owners. BOATER SAFETY CLASS — offered every spring for the State required Boater Certification for anyone born prior to 1978. WATER QUALITY TESTING — initially handled in cooperation with the Huron River Watershed Council and more recently volunteers from each lake collect samples to measure water clarity, phosphorus levels and other information. The collected data is analyzed by CLMP. MICHIGAN RIPARIAN — subscription for all members provides informative articles and issues other lakes in Michigan experience. FLOOK DAM — work with Washtenaw County to monitor and insure timely repairs and establish effective lake levels. ANNUAL MEETING — held each May helps the Board meet and understand needs and concerns of our members. It is our chance to give you an overview of what we have been working on and address new challenges. We also try to provide an educational speaker/ for the event. PIZZA PARTY — held in August with great success. An informal gathering for members to meet other members…. we buy the pizza! 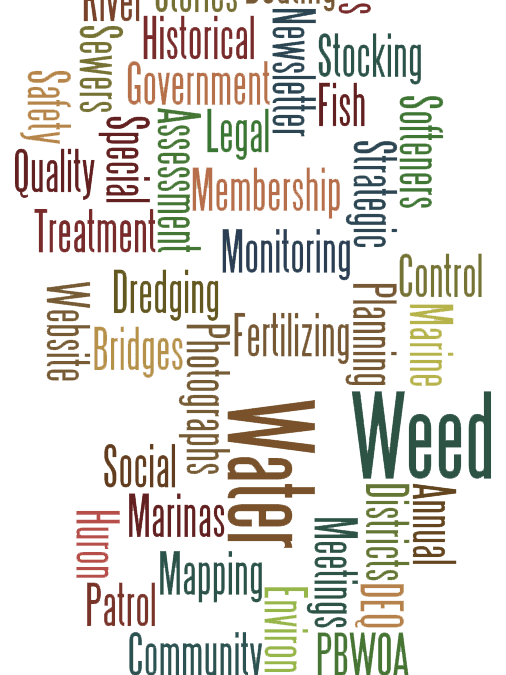 Most recently the more immediate concern of members has been the growing issue of invasive species, particularly aquatic weeds. With monetary support from all four townships, businesses and private individuals, PBWOA has contracted with Restorative Lake Sciences Company for a scientific study to survey, analyze and produce a detailed report of what species we have, where they are, their size and provide an unbiased recommendation for the best treatment methods. The study is slated to begin June, 2015 and our hope is results from this comprehensive study will pave the way to a holistic management program to combat current as well as new invasive species. Stay tuned!!! In an effort to stay better connected and make information more current and available to members we are implementing this new updated website! We are hoping it is easier for you to use and provides more current information. We welcome your input! !